I know I mentioned yesterday that things have been a little crazy around here lately and I know it is mean to dangle things in front of you guys, so here we go! 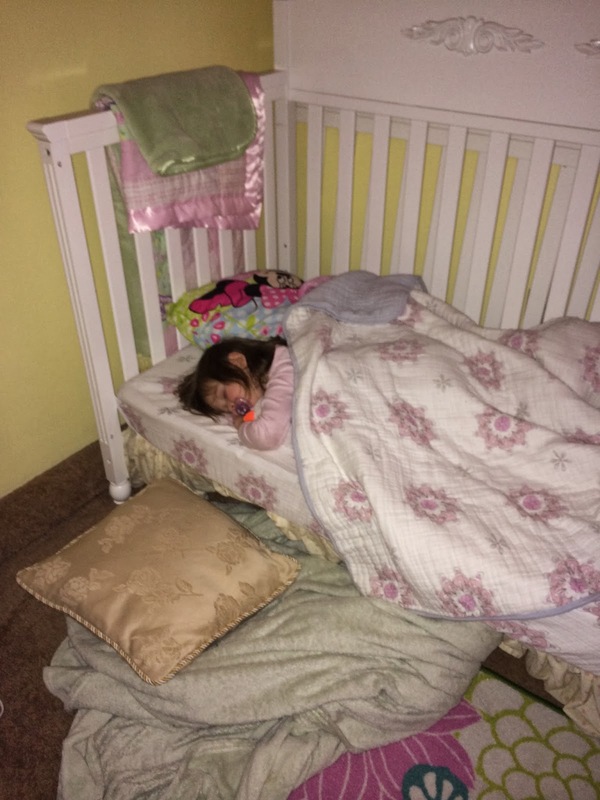 A few weeks back she forced us to convert her crib to a toddler bed. Before this she had spent little to no time awake in her crib so she had no opportunity to learn. We would rock her to sleep and then set her down. She was going through a no nap phase where she would not tolerate being transferred, so we decided to try a camp it out method for awhile instead. At nap one day she discovered how to climb out of her crib, I put her back in and she was back out in about 5 seconds. That night we lowered the crib down again, but like a flash the next morning she was out. This is when we decided that it was unsafe to leave things as it was and fully converted her bed. When we purchased her crib, one of our priorities was to get a 4-way convertible crib so she would have a nice wooden bed for the foreseeable future all in one purchase. This mean it was very easy to change her bed over to a toddler bed, we simply dropped the mattress all the way and removed the front panel. I am sure this helped her with the transition as it was a marginal change. Before the change she was sleeping through the night, but has unfortunately regressed. She is now waking 1-2 time per night, though I think she is starting to sleep through the middle of the night waking again. When we moved her to her new bed we decided to mix up her sleep routine. We decided to no longer rock her, but instead sit beside her bed until she sleeps. This means we lost the only times she was nursing. Before it had to be me rocking her down both for nap and nighttime because she insisted on nursing, though the session lasted only abut 2 minutes. Because she was going through a sleep regression phase this was leaving me isolated in a dark room up to 4 hours a day and it was becoming a burden. So with her only nursing perhaps 2 ounces a day, and fast approaching her second birthday, we seized the opportunity and weaned. I have decided that I am very much ok to be done breastfeeding her. I am so pleased that my husband is able to help in the nighttime routine again. She doesn't seem to miss it either, during the first week she asked maybe 3 times before her nap, but gave up almost immediately. She hasn't asked again since then. Lastly we have chosen another transition. The week after her second birthday party we purchased a potty seat for her and began cold turkey potty training. Certainly because it was a completely foreign concept, she took some time to adjust and learn. She first "made it" on her third day of learning. We have had good and bad days since then, but yesterday on her 8th day of learning she was accident free until just before bed. She is still diapered at nap and at night (thank goodness or I might have gone into AppleCheeks withdrawal!) but I feel like she is really getting the hang of it. So I hope that long winded post has given you some insight into our life right now. We are definitely in a time of transition and with a bittersweet perspective are watching our baby girl grow into a little girl. I know there are some other very large changes approaching in our future, so I doubt that our life will be slowing down any time in the future!